The U.S. Treasury Secretary wants a federal judge to dismiss a Florida man’s lawsuit seeking to place 10 men on Presidential $1 coins who, he says, were presidents before George Washington. The United States Mint was placed under the auspices of the Secretary of the Treasury of the United States in 1981. Stanley L. Klos of Palm Beach, Florida wants Treasury Secretary Paulson to use his authority to have coins minted for the men who were Presidents of the United States in Congress Assembled under the Constitution of 1777, also known as the Articles of Confederation as adopted in March of 1781. The historically significant leaders Klos speaks of are Samuel Huntington, Thomas McKean, John Hanson, Elias Boudinot, Thomas Mifflin, Richard Henry Lee, John Hancock, Nathanial Gorham, Arthur St. Clair and Cyrus Griffin. Men, he says and discusses in his book, President Who? Forgotten Founders, who not only held top positions in U.S. history, but signed national documents as President. The lawsuit was filed in the Middle District of Florida on May 1, 2008 with U.S. District Judge Steven D. Merryday presiding. Today’s motion for dismissal argued in part that Klos’ contention of "Constitution of 1777 Presidents" serving in the same capacity as President George Washington and his successors was immaterial. 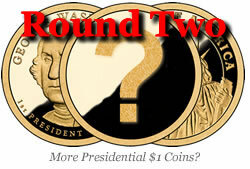 The motion pleads that the case lacks merit because the Presidential $1 Coin Act of 2005 dictates the coin images — not Paulson.